Located in front of the Nageen Lake, in Srinagar, Wangnoo Houseboats offer appealing and fascinating picturesque views to guests boarding the Srinagar tour. 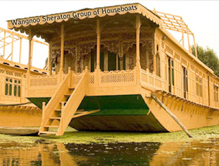 It is counted among one of the best super deluxe houseboats by the Srinagar tourism department. Equipped with modern and convenient facilities, the houseboat is perfect for visitors seeking for relaxing holidays in Srinagar. It is situated at a short distance from the city square. Other interesting tourist destinations near Wangnoo Houseboats include Batt Bagh, Salfia Masjid, Hari Parbat Fort, Nehru Garden, Chashmashahi, Shankaracharya Reserved Forest, Mughal Gardens and Nishat Bagh. The cozy lodging and homely ambience in Wangnoo Houseboats offer a mesmerizing experience to the guests and influence them to seek accommodation in the same houseboats every time they visit Srinagar for vacation. How to Book: For booking accommodation in Wangnoo Houseboats, Call us at Tour My India. We will get your booking done with ease. 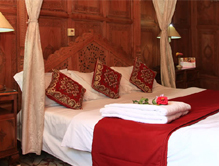 Also, you can avail exclusive discounts and deals on Srinagar houseboat reservation through us. We even organize various fun activities like trekking, skiing, skating and rafting on request to make your trip more memorable.